Wow, those are gorgeous. Congratulations! Did you do your own photograph??? Good luck with the compittion. I want to apply for it as well but kept missing the deadlines! Thanks Erin, thanks Vipoo. Yeah, it's hard to keep track of those deadlines isn't it! I take all my own photographs these days (is it THAT obvious!!). They probably leave a little to be desired, but I'm gradually getting better! Your photography isn't too bad. Your work is sooooo amazing it doesn't make that great of a difference! Thanks Mrs Epp, and pinholeman - regarding the photography, coming from the MASTER i will take that as a HUGE compliment!! Hooray! How nice to be "selected"- must give you a warm glow huh? I think your photos are really lovely actually. And prunes aren't all that bad when used correctly you know. Mel - I love your work - I bought one of these a little while back and absolutely love it. Was stoked too find you have a blog! 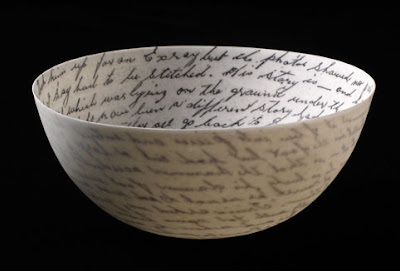 Ceramics, birds, handwritten script..is there anything better?